This combination of Half & Half Lacing and Straight Bar Lacing forms a series of horizontal "bars" of alternating colors. • Start with a bi-color shoelace, where half the length is one color and the other half is a different color. • Begin on the inside with the ends emerging through the bottom-left eyelet and the next higher eyelet. 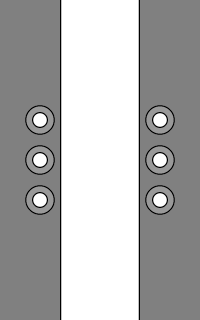 • Both ends run straight across on the outside and in through the adjacent eyelets, then continue straight straight up on the inside, each skipping one eyelet and emerging two eyelets higher up. • Alternate running across on the outside and up on the inside until lacing is completed. • Tie together two half-length shoelaces of different colors using a simple joining knot (eg. Reef Knot). • Both ends run straight across on the outside and in through the adjacent eyelets, then continue straight up on the inside, each skipping one eyelet and emerging two eyelets higher up. • Start with two half-length shoelaces of different colors, each with a simple stopper-knot tied in one end. 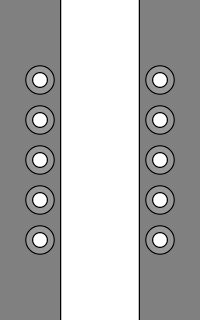 • Feed the un-knotted end of one half-length shoelace out through the bottom left eyelet. 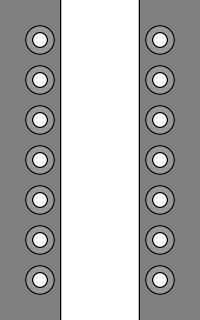 • Feed the other half-length shoelace out through the second eyelet from bottom-left (for even numbers of eyelet pairs) or bottom-right (for odd numbers). 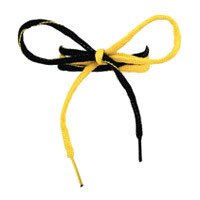 • Where bi-color shoelaces are not available, an alternative is to use two half-shoelaces of different colors, either knotted together to form a full-length bi-color shoelace (as per variation 2), or each half tied off with a stopper-knot and fed separately through the bottom eyelets (as per variation 3). • These instructions and diagrams show the join between the two colors hidden inside the shoe at the bottom-left. This will result in uneven end lengths at the top of the shoe because one colored end travels further than the other. 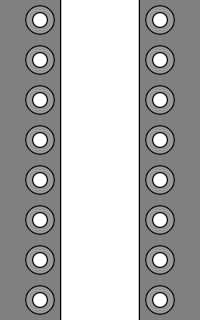 - For shoes with an even number of eyelet pairs, the lower half-shoelace should be longer by the horizontal distance (H) between two eyelets plus the vertical distance (V) between two eyelets (ie. H+V). 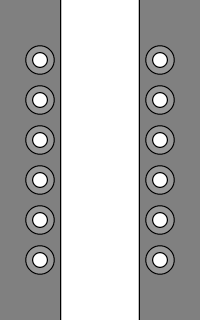 - For shoes with an odd number of eyelet pairs, the lower half-shoelace should be longer by only the vertical distance (V). TIP: If working out the lengths all sounds too complicated, use my Shoelace Length Calculator to determine the exact length of each piece of shoelace. Red és Breezes with Half & Half / Straight Bar Lacing. Lengths available: 27" 27" 27" 36" 36" 45" 45"
Lengths available: 27" 27" 27" 27" 27" 27" 27"
NOTE: These are approximate shoelace lengths for using this lacing on an average sized sneaker. For more accurate lengths, use the Shoelace Length Calculator. These shoelaces from TyingIsASnap.com come with a plastic "snap" fitting in the middle of the lace, allowing easy mixing of different colors and textures. The laces are specifically designed for teaching kids to tie shoelaces, with a length suited to kid-sized shoes, plus they have a nice texture for good grip and security. 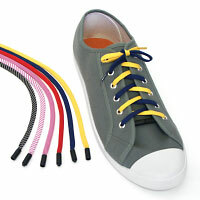 These shoelaces from JunctionOfFunction.com are part of their "Shoe Tying Made Simple" kit for teaching children. Available in a limited range of colors and lengths: 42-inch for kid-sized shoes or 50-inch for adolescent-sized shoes. These shoelaces from Ringelspitz are available on the German website Amazon.de. 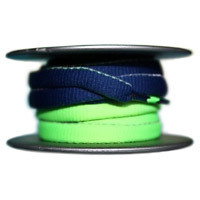 The laces are available in three color combinations (black/white, blue/green, orange/purple) and in one length (120 cm). • Select rating, then click button to submit. • Or, view results without rating this method. 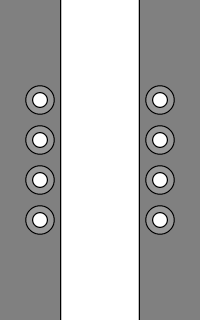 Identical lacing for single-color shoelaces (although the diagrams are bi-colored). Same Half & Half shoelace technique applied to Criss Cross Lacing. This page last updated: 29-Mar-2019. Copyright © 2014-2019 by Ian W. Fieggen. All rights reserved. Website created by Ian Fieggen (aka. "Professor Shoelace"), inventor of the Ian Knot.